This visually stunning action-adventure film, based on the best-selling novel by Jaws author Peter Benchley, stars Nick Nolte and Jaqueline Bissett as a couple on a romantic holiday in Bermuda. New Yorkers, David Sanders (Nolte) and Gail Berke (Bissett) are enjoying a much-needed vacation; while diving one day they discover the sunken wreck of a WWII freighter and unearth a gold coin as well as a mysterious glass ampule. Excited, they believe their discovery could be a long lost treasure, but they soon learn that their most valuable discovery is actually an ampule of morphine, one of thousands left behind on the medical supply ship. This discovery leads them into the hands of Henry Cloche (Louis Gossett Jr.), an extremely dangerous and powerful Haitian drug dealer who will stop at nothing to unearth the dangerous treasure. With the help of Romer Treece (Robert Shaw), an old treasure hunter, David and Gail soon realize that they have made a much more important discovery than the morphine and set out to keep their actual treasure a secret. Director Peter Yates's suspenseful film features death-defying dives and exquisite underwater photography. $6.835 million on 731 screens. A genre-defining blockbuster such as Jaws is tough to follow, so the second big-screen adaptation of a Peter Benchley novel had big shoes to fill. Perhaps 1977’s The Deep could’ve avoided so many comparisons to Jaws if it’d remain land-based, but any Benchley work set at sea would inevitably draw parallels with the earlier classic. No one gets eaten in The Deep, though. It introduces us to a couple in Bermuda on a holiday. While on a dive, Gail Berke (Jacqueline Bisset) and David Sanders (Nick Nolte) discover a mix of trinkets. They’re more interested in a potentially valuable medallion, but they stir up more intrigue with a small glass vial they locate. It turns out that they found an ampoule of morphine from a sunken military ship. Haitian drug kingpin Cloche (Louis Gossett, Jr.) wants to dig up the thousands of other vials he believes exist, and local treasure hunter Romer Treece (Robert Shaw) hopes to keep the morphine out of Cloche’s hands. Treece also believes he can dig up many more non-narcotic valuables. David gets involved with Treece as they attempt to find the riches and stay one step ahead of Cloche. 32 years after the film’s release, I believe people remember The Deep for two reasons: Benchley’s name and Bisset’s chest. By far the most enduring visual found here comes from the sight of Bisset in a wet T-shirt. And a splendid sight it is, but it’s not enough to keep us occupied for two hours. Indeed, since the wet T-shirt scenes show up at the flick’s start, you can turn it off after about 10 minutes and not miss anything. Which leads back to the other reason The Deep maintains a public profile: Benchley. Without the then-recent success of Jaws, I can’t imagine anyone would’ve made The Deep. Benchley could’ve produced a novel about dogs playing poker and it would’ve been on the fast track to the big screen after the huge profits earned by Jaws. A flick about gambling canines might be more interesting than The Deep. That’s why I suspect that the same story under another name would’ve never seen the light of day; this is such a dull, forgettable tale that I have to imagine it’s only Benchley’s name that allowed it to go anywhere. Maybe that’s unfair to Benchley, as I suppose it’s possible the original novel worked better than the movie. However, since Benchley co-wrote the screenplay, I think much of the responsibility remains on his shoulders. Unless director Peter Yates and all others involved somehow totally ruined a tight novel and a strong script, I blame Benchley for this turgid mess. Not that any of the others do anything to make The Deep overcome its inherent flaws. Even with an excellent cast, we’re stuck with bland, one-dimensional characters. What’s Treece other than Jaws’s Quint with better grooming and a little more decorum? At least Treece sorta kinda manages to display some flair; that’s a heck of a lot better than dishwater dull David and Gail. David is there largely as a plot device; he exists to allow some action to happen, but the movie cares more about the interactions between Treece and Cloche than it does the lovers. They should’ve gone bye-bye after the first act, but I suspect the filmmakers think we need to keep them as the audience’s proxy. We don’t, and they become redundant by the end of the first hour. Poor Bisset really gets the fuzzy end of the lollipop. She exists as a lovely prop and little more. She’s also the token damsel in distress, there to trigger the occasional dramatic scene – or at least the movie’s dull attempts at drama. Bisset looks awfully good, but she doesn’t have anything to do here. The Deep features some appealing underwater photography, but it’s supposed to exist as something more than just a travelogue. I admire the fact that Benchley didn’t just rework Jaws, but his tale shows no signs of life. As a cinematic adventure, The Deep flops. 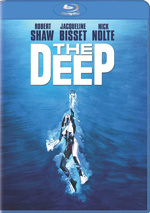 The Deep appears in an aspect ratio of approximately 2.35:1 on this Blu-ray Disc. While something of a mixed bag, the transfer usually satisfied. Sharpness was good. On occasion, I saw a little softness in some wider shots, and even a few tighter images came across as a wee bit ill-defined. However, those instances manifested themselves infrequently, as the majority of the flick displayed nice clarity and delineation. I noticed no issues with jagged edges or shimmering, and the movie lacked edge enhancement. Source flaws were also a non-factor. I witnessed a couple of small specks, and grain could be heavier than expected at times, but neither issue bothered me. Colors looked pretty nice. The tropical setting allowed for a broad array of hues, and the film brought them to life in a positive manner. Blacks tended to be reasonably dark and dense, but shadows were less consistent. Some of the problems related to the use of “day for night” photography; as usual, those shots tended to be rather opaque. Even so, some other low-light images looked a tad too thick. Nonetheless, I found a lot to like here and thought the transfer deserved a “B”. While also a bit inconsistent, the Dolby Digital TrueHD 5.1 soundtrack of The Deep seemed quite good for its age. My only complaint related to the quality of some effects. On occasion, the foley worked sounded somewhat distant and artificial. That wasn’t a consistent complaint, but it created some mild distractions. Otherwise, the quality of the audio was positive. A few lines seemed somewhat stiff, but most of the dialogue came across as acceptably natural. The majority of the effects displayed nice accuracy and depth; other than the handful of artificial-sounding bits, those elements were pretty full and robust for their age. Best of all, John Barry’s score offered terrific clarity. The music consistently sounded warm and rich; that was easily the strongest aspect of the track. I also thought the soundfield was pretty involving, especially for a track from 1977. The mix opened up matters well. Some localized speech appeared, and those bits occasionally could be a little dodgy; at times, the lines weren’t especially well located. Nonetheless, most came from the appropriate spots. Music continued to excel, as the score boasted well above-average stereo imaging. Effects also broadened the horizon in a satisfying manner. In particular, dive sequences added a lot of zip to the experience. Those scenes used the five speakers in a manner that engulfed us in the watery domain. All in all, the soundtrack worked very well. Only a few extras round out the set. An archival TV special from 1977, The Making of The Deep runs 48 minutes, 40 seconds. 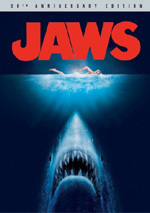 Hosted by Robert Shaw, we also find comments from writer Peter Benchley, director Peter Yates, producer Peter Guber, underwater directors Stan Waterman and Al Giddings, and actors Nick Nolte, Lou Gossett and Jacqueline Bisset. The program covers locations and shooting at sea, the novel’s origins and some story issues, filming the diving and aquatic life scenes, and some effects. Since “Making” aired on CBS in an attempt to sell movie tickets, it comes as no surprise that it comes with a promotional tone. Still, we get a lot of good shots from the set, and we learn a reasonable amount about the shoot. It’s not a great piece, but it’s worth a look. Six Selected Scenes from the 3-Hour Special Edition fill a total of 21 minutes, 29 seconds. We find “Prologue: The Goliath Sinks” (3:08), “Romer Treece’s Disposition” (1:06), “Treece and David Harassed by Cloche’s Goons” (2:12), “Pillow Talk” (6:22), “Extended Conversation between Cloche and Treece” (3:22) and “Treece’s Past Revealed” (5:19). As indicated by the title of this collection, these sequences first appeared as part of an extended cut of the flick that aired on TV. Should any of them have been in the theatrical version? Probably not, as the 124-minute edition is slow and dull enough as it is. The “Prologue” is moderately interesting to see, but the movie doesn’t need it, and it probably telegraphs story information too much. Some of the other clips include a bit more character info, but don’t expect this to add up to much. The participants remain pretty thin and forgettable. While I don’t think much of these cut scenes, I’m sure fans will be happy to see them, though it’s a disappointment that the Blu-ray didn’t provide all of the footage added to the three-hour version. A bunch of ads appear under Previews. These include promos for Close Encounters of the Third Kind, Dr. Strangelove, Secret Window, The Dark Crystal, The Da Vinci Code, and Rocky Balboa. No trailer for The Deep pops up here. Although The Deep shares a lot of connections to Jaws, it doesn’t remotely compare to the high quality of that cinematic masterpiece. Instead of action, drama and interesting characters, The Deep provides a dull experience that seems more suited to TV movie territory. The Blu-ray provides good picture and audio as well as a few moderately interesting supplements. This is a quality Blu-ray for a mediocre movie.